The Internet has provided a connected, digital environment that allows much of the world’s population to enjoy the benefits of exchanging a wide variety of information for commercial, scientific, and social activities. This connectivity also spawned the vision of a smart community—a community in which information technology (IT) plays a major role in the decision-making process and provides an improved quality of life for its residents. Cologne is on a major European river so flooding is an ever-present danger. 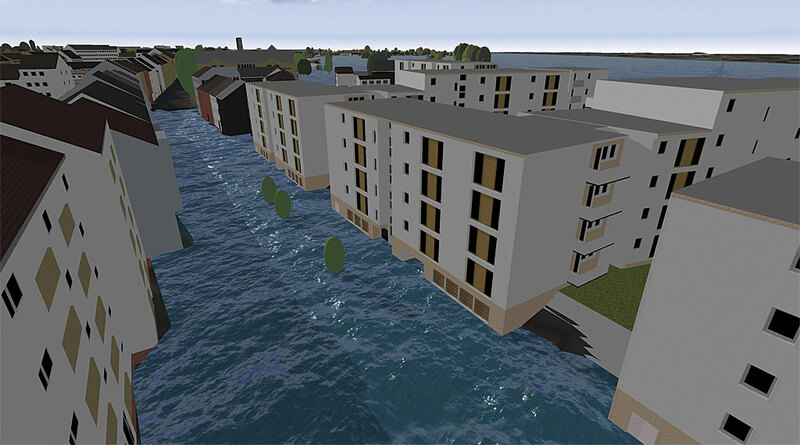 Using Esri CityEngine to model existing flood data provided the visualization of flood inundation levels in Mülheim Süd. Today, the maturation of information technology, particularly improvements in computer speed, real-time monitoring and feedback, device independence, and the integrating capabilities of GIS as a platform, is transforming the smart community from a theoretical concept into reality. This transformation comes none too soon. World population is predicted to be 9.7 billion people by 2050, and two-thirds of those people will live in cities. This huge increase in population will significantly strain the services required by urban dwellers. In China alone, 350 million people are expected to move into cities during the next two decades, according to Wu Hongbo, undersecretary for the United Nations Department of Economic and Social Affairs. “Clearly, such massive changes will pose social, economic, and environmental challenges, while also creating tremendous opportunities,” said Hongbo. Population growth necessitates increased public transportation capacity, expanded utility services, more affordable housing, better educational opportunities, and a greater emphasis on public safety. The common thread linking these services is the need for integrated planning and analysis. Cities have long suffered from a lack of comprehensive planning, unsustainable development, and the ineffective use of resources. Ongoing efforts undertaken throughout the world to better understand the complex dynamics of urban life seek to create sustainable cities in the future. For many years, the Fraunhofer Society, Europe’s largest application-focused research organization, has analyzed the expansion of population worldwide and its impact on resources. Its research is used to develop solutions for the problems inherent in unsustainable growth and apply these lessons to future development. 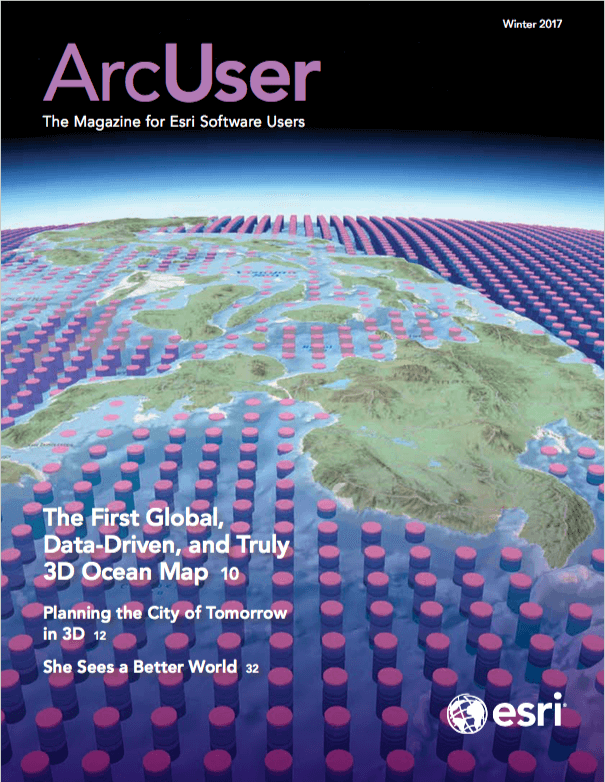 In 2010, the society launched Morgenstadt: City of the Future. The goal of this initiative is to develop and implement technologies for future cities that are climate adapted, carbon dioxide neutral, and energy efficient. In Phase 1 of the project, the society evaluated Berlin, Copenhagen, Freiburg, New York City, Singapore, and Tokyo to determine sustainability best practices and their impact on the quality of life based on emerging technologies and new business models. By analyzing the six cities on-site in-depth and from the viewpoint of different disciplines, the Fraunhofer city teams identified the main action fields for sustainable development for each of the six cities. These action fields show how these cities are addressing challenges and opportunities to better understand strategies and priorities adopted by the six cities. Eighty-three defined key action fields for sustainable development were represented in the Morgenstadt model’s core. Applying the results from Phase 1, the society then launched City Lab to test the use of different innovative information and communication technologies to determine their effectiveness in helping the city of the future be more livable and resilient. Fundamental to the project is the society’s belief that interdisciplinary collaboration lies at the heart of urban innovation. Participating cities are implementing projects that include the analysis of the link between sustainable mobility and energy consumption and the use of sensors to collect data in real time for the development of data-driven services. Cologne is a major German city on the Rhine River. Its history stretches back 2,000 years to its founding as a Roman outpost in the Rhineland. In 2012, the city was selected to implement a Morgenstadt Phase 2 project that examined the best methods to revitalize the aging industrial, commercial, and residential district of Mülheim Süd and transform it into a new and sustainable community in the next 20 years. The proposed design was developed by a consortium of architects and urban planners, including BOLLES + WILSON, ksg Architekten und Stadtplaner, and KLA Kiparlandschaftsarchitekten, which were selected through a competition organized by the City of Cologne. The design incorporates residential, commercial, and recreational areas within a green infrastructure to provide a safer, more attractive, more enjoyable, and healthier environment for those living and working in the area. Three-dimensional noise models were created from 2D data and used to determine the impact that noise would have on specified areas and how sound would resonate throughout the area. Jörg Schaller used Esri CityEngine to complete an interactive 3D model of the design to visualize planning alternatives for Mülheim Süd. (Schaller is professor at the Technical University in Munich; the owner and director of the German environmental consulting group Prof. Schaller UmweltConsult GmbH (PSU); scientific director of Esri Deutschland Group GmbH; and cofounded Esri Deutschland in 1979.) 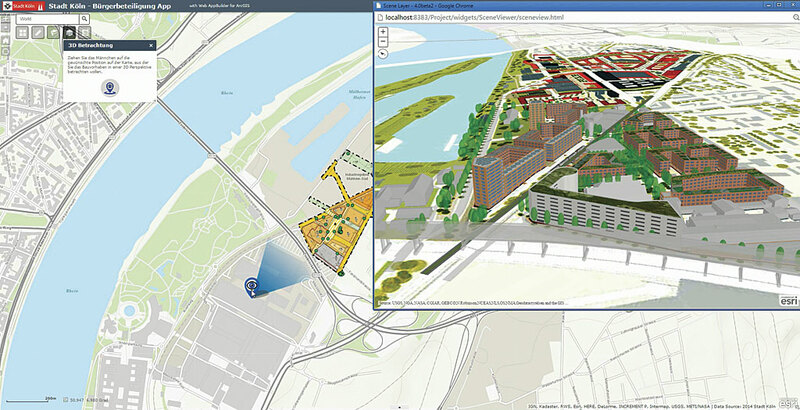 CityEngine is a software modeling package for urban planning that is integrated with ArcGIS technology. Many datasets were needed by PSU to complete the project. The City of Cologne provided a digital terrain model (DTM); digital surface model (DSM); cadastral data; high-resolution orthophotos; aerial photos; Building Energy Specification Table (BEST) and Energy Performance Certificates on the buildings that are currently in an old residential quarter of the project area; master plan document; development plans; environmental data; and models for flooding, air pollution, noise, and traffic, as well as related statistical data. “Other input included lidar elevation data and a BIM [Building Information Modeling] data, all of which we integrated with CityEngine to develop our 3D model of a redeveloped Mülheim Süd,” said Schaller. “Including the BIM with CityEngine allows architects to align their design with that of the planning engineers’ work, which can’t be done with BIM alone. In future development stages, the 3D model of the entire district can be used for the city planning process, public participation initiatives, and energy and environmental modeling.” PSU used these datasets and models, combined with the plans and sketches of buildings, walkways, parks, and other features proposed by the architects and urban planners, to create detailed 3D models to support a new master plan of a revitalized Mülheim Süd. These models take into consideration several environmental factors. By integrating CityEngine with Building Information Models (BIM) in the redevelopment plan for Mülheim Süd, architects can align their design with that of the planning engineers' work. Reducing sound levels in cities is another major consideration when improving the quality of life for residents and workers. 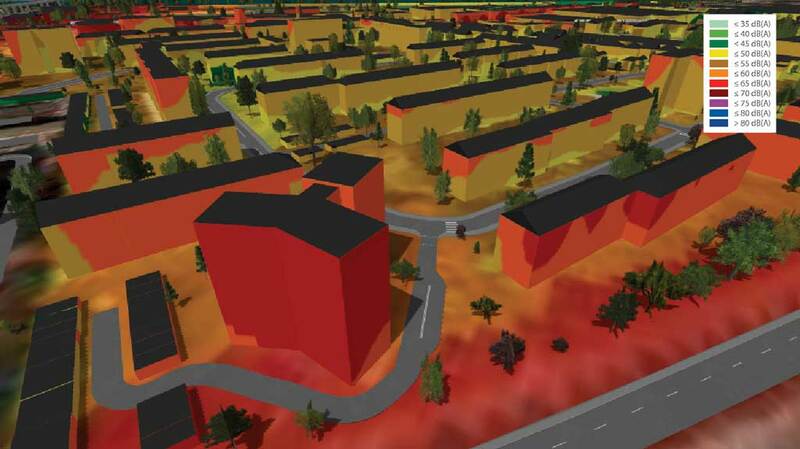 Together with Esri partner n-Sphere from Switzerland, PSU spatially modeled potential noise levels in Mülheim Süd using CityEngine and ArcGIS Geostatistical Analyst with the 2D noise level data provided by the city. Three-dimensional noise models were created from the 2D data and used to determine the impact that noise would have on specified areas of the previously created building facades and how sound would resonate throughout the area. With related statistical information, it is possible to determine how many people would be affected by the different noise levels in different development scenarios. Energy conservation is also an important factor in a smart community. For each building within a selected district quarter in Mülheim Süd, a BEST table was created by the SmartCity Cologne initiative. This is required by the European Union’s Horizon 2020 plan for promoting low energy consumption and indicates the building’s energy needs for heating, lighting, and hot water. Each 3D building model in the selected quarter was color-coded by its actual energy consumption and its potential energy saving in the future scenarios. Central to the SmartCity Cologne initiative is citizen participation. An online citizen participation app was developed by PSU and the company 52oNorth that gives residents the opportunity to evaluate and comment on the redevelopment proposals. It will be available soon at the SmartCity Cologne website. This helps the city engage with its residents as it continues its smart community development.